Trails for Two Wheels: Five Top Spots for Kid-Friendly Mountain Biking | Fit Families | Kids VT - small people, big ideas! With crisp mornings and sunny afternoons, fall days are perfect for mountain biking. It's a great way to enjoy the vibrant foliage this time of year. And, thanks to Vermont's world-class trail network with plenty of excellent beginner rides, it's an activity both kids and adults can enjoy. So grab your helmets, pack up the bikes and head out to these five locations, chosen with the whole family in mind. This wonderful 16-mile multiuse trail network sits on 300 acres in the northwest corner of Rutland City. The spot is easily accessible, but has the feel of remote woodland and includes several tranquil streams and the shores of peaceful Rocky Pond. The trails are host to kids' groups and summer camps, and some of them were even built by local school groups. The trails were designed in a stacked loop system so that the beginner trails are closest to the parking lot and the intermediate trails take riders up bigger climbs and over longer distances (although some advanced trails are closer to the parking lot, affording quick and easy access). Mountain bikers, runners, dog walkers and hikers use these trails, so bikers should ride slowly when approaching others and yield to other users. The trails are well marked using a numbering system. Maps are available at the park and on the Rutland Recreation and Parks Department website. These fun trails swoop and turn over gentle features, like berms and rollers. The trails were built with kids, families and beginners in mind, but are designed to be fun for advanced riders as well. Tootsie Roll is a great warm up and is short enough to take several laps — try riding it in both directions! Lenord's Loop is a longer ride that takes riders to the top of the ridge and back down, with the option of a winding side loop near the top of the ridge named Flying Squirrel. Signage is excellent and maps are available from Mad River Riders. Pack your swimsuits and towels, too; on a warm day, enjoy a post-ride swim in pristine Blueberry Lake, with the beautiful Green Mountain National Forest as your backdrop. This is perhaps the best network in the state for families to ride because the trails can accommodate all ability levels. With over 60,000 mountain-biker visits each year, it's the mecca for riding on the East Coast. A day pass is required: Adults are $15, kids 8-16 are $7, and kids 7 and under are free (riders 70 and older are free as well!). The Welcome Center, located behind the Northeast Kingdom Country Store in East Burke Village, is the place to start. The staff will set you up with passes, maps and recommended routes. More information is available online, including a web page about riding with kids. The Country Store is an excellent place to grab a post-ride sandwich. Save room for dessert at the ice cream stand across the street. These trails have a smooth flow, with Extendo and Lower Flo being the best options for beginners and young riders. Extendo is a loop that makes a great warm-up, with a tiny bit of climbing and fun berm turns. The sandy trail makes for a soft landing for any falls. Lower Flo is a great place to introduce kids to features like bridges, rocks and roots. There is a trail map on the kiosk at the trailhead (pro tip: take a photo of it with your phone to use during your ride), or maps can be accessed online by purchasing an annual membership to the Fellowship of the Wheel. Located behind Costco, this trail network is extremely popular and easily accessible for Chittenden County families who don't want to spend a lot of time driving to a trailhead. 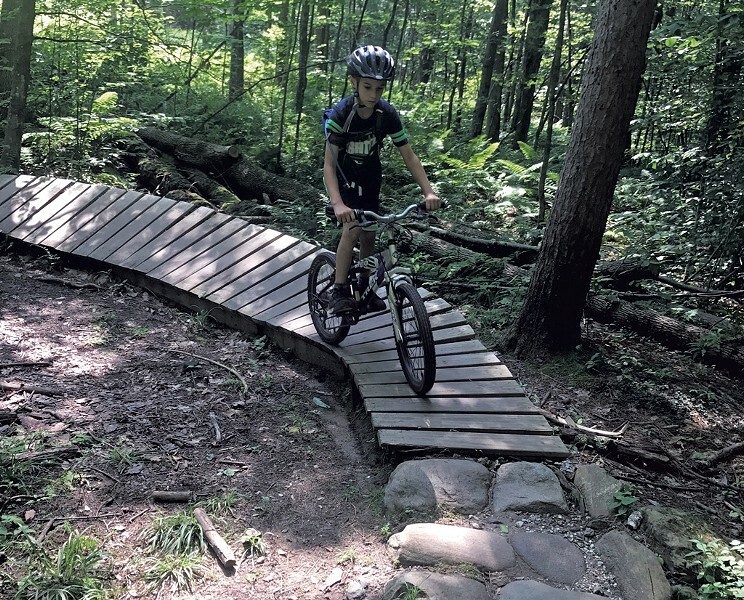 The upper loop, known as Blueberry Loop, is relatively flat and smooth with far fewer rocks and roots than other trails, making this a great option for kids and new riders. As with Saxon Hill, there is a map on the kiosk at the trailhead, or find one online with an annual FOTW membership. Before you head out, check trail status and conditions on the trail club's website. Be good stewards by holding off on riding when the ground is wet or when trails are closed, such as after a significant rain event. Trail systems close for the season in late fall. Mountain bike trails are marked for difficulty with the same system as ski trails: green circle for beginners, blue square for intermediate riders, and black and double-black diamonds for advanced riders. Twenty-eight local chapters of the Vermont Mountain Bike Association build and maintain these trails. Consider supporting their work by joining VMBA. Members not only get the pleasure of knowing their dollars go to increased trail access, but they also enjoy a long list of benefits like deals at bike shops, restaurants and ski resorts.